“We will go to the moon. We will go to the moon and do other things, not because they are easy but because they are hard.” – John F. Kennedy, Jr. In February of this year, I created myself a vision board. I wanted to visually capture all my goals and dreams for the year. According to the article The Importance of a Vision Board, vision boards are a terrific tool that combines success and motivation techniques and keep them all in one spot where we can view them on a daily basis. So in order to keep myself motivated, I cut out words of inspiration. I took words from magazines that said, engage, get fit, smile, financial freedom, dare to have it all, and go the distance. 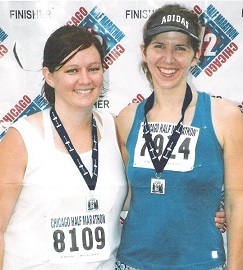 So in an effort to go the distance, my life long friend Angie Walker Thompson and I are setting our sights on the LiveStrong / Austin Half Marathon in February 2012. We are teaming up with Team LiveStrong to make a difference in the fight against cancer and raising $500.00 for the organization. We are Team Going the Distance! If you would like to contribute to our goal, we would greatly appreciate it!! And then God answered: “Write this. Write what you see. It aches for the coming—it can hardly wait! And it doesn’t lie. If it seems slow in coming, wait. It’s on its way. It will come right on time.